You can save both time and money on airport parking at George Bush Houston Intercontinental Airport(airport code IAH). Looking for Houston Hobby Airport? It is always good to save valuable money and time, especially when traveling, but what if you could also save yourself some pre-flight stress? Pay online for one day of parking at George Bush Intercontinental Airport to save yourself a spot, and on the day you leave drive your car to the lot at your appointed time and drop it off. When your car is taken care of, you just need to hop on the airport shuttle which will whisk you to the airport in no time. There are about ten Houston airport parking locations to choose from. Examples are “Air Park IAH,” “Allright Airport Parking,” “Rocket Parking” and “PreFlight Airport Parking.” A majority of the lots are along Will Clayton Parkway. The airport is 23 miles north of downtown Houston, between I-45 and Highway 59, inside the Houston city limits. Flights reach more than 220 destinations, second only to Atlanta in terms of travel options. It is the headquarters of Continental Airlines, and offers service to the most destinations in Mexico. Services at the airport include a variety of places to dine and shop, as well as a business center and an interfaith chapel. A inter-airport train connects the various terminals. Commissioned artwork is displayed through the airport. For up-to-date traffic information, check out Houston TranStar here. Taxi: Various taxi services will charge approximately $45 to travel from downtown to the airport. Rail: There is no rail service connecting downtown Houston with the airport. Bus/Shuttle: Houston Metropolitan Transit Authority (METRO) offers a variety of routes that stop by the airport, including the Bush Intercontinental Airport Express (Route 102). Planning a long drive to or from the airport, or an odd-hours flight? 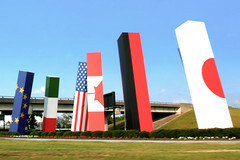 Check out Houston Airport (IAH) park and sleep hotels. Don’t fancy driving to the airport? Or leaving your car there and paying for parking? Catch a shuttle to Houston airport.